A man hacked his father to death and seriously injured his younger brother to vent out his anger against his father for solemnising his brother's marriage. 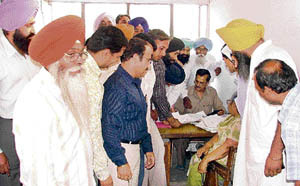 Two days after employees of drawing branch of the Municipal Corporation went on a month-long mass protest leave, employees of the building branch also followed suit and sent mass applications to the local bodies department to protest against the Vigilance Bureau action on their colleagues. Close on the heels of tragic death of two cousins due to an incestuous relationship, another incestuous relationship has led to registration of a case against a youth for allegedly establishing physical relations with his cousin on the lure of marrying her. Four weeks after a joint group of different underworld gangs of the city had murdered an alleged gangster Billu Badshah, three of the main accused surrendered in a local court this afternoon. After working on the weekend, the Municipal Corporation earned a revenue of Rs 75 crore from pending house tax, water supply and sewerage bills. Employees of Federal Bank observed a day-long strike in protest against the management's inaction on their demands. The last day of the financial year saw heavy rush at income tax offices and bank branches as assessees made a beeline to deposit service tax and furnish income tax returns here today. Much-awaited demand of city lawyers to have a branch of post office in Lawyers Chambers complex was fulfilled today with the strenuous efforts of president of the District Bar Association (DBA) Parupkar Singh Ghumman. Even as the municipal corporation has announced a cleanliness week, the safai karamcharis are ruing that they were not provided with required material used for cleaning. A city-based dental professional and former head of dentistry at Dayanand Medical College and Hospital, has been invited attend an international discussion on the latest developments in the field of dental implants. Minister of tourism and culture Hira Singh Gabria, who visited the Punjab Agricultural University, has said efforts are being made to bring Ludhiana on the tourism map of Punjab. While visiting the museum of rural life of Punjab on the university campus, Gabria said the museum could be developed into a heritage village to project cultural heritage people living in Punjab. 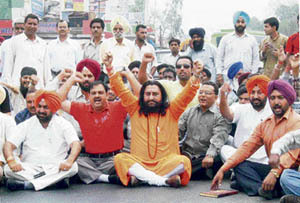 To protest against the brutal killing of five activists of the RSS at Kanoor in Kerala recently, activists of the RSS, Bajrang Dal and BJP organised dharnas and blocked traffic on the Ludhiana-Malerkotla and Ludhiana-Chandigarh roads today. The Kharar police arrested Jaswinder Singh alias Kala, a resident of Dhadak Kalan village, with 1.12 quintals of poppy husk near Rattanheri village. The accused is a proclaimed offender in a narcotics case and has been declared absent from court proceedings in yet another narcotics and excise case. 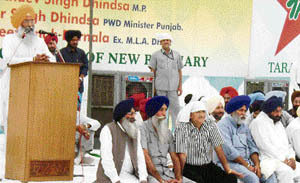 Shiromani Akali Dal secretary-general and MP Sukhdev Singh Dhindsa from Sangrur has called upon office-bearers of various social and educational organisations of the state to launch a coordinated move to educate farmers about the consequences of degradation of the biosphere in general and soil in particular by reckless addition of pesticides and chemical fertilisers. 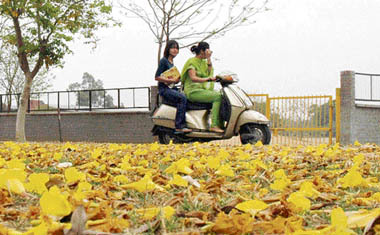 Indira Gandhi National Open University has decided to offer walk-in admission round the year for all academic programmes. All these programmes will be offered in January as well as July cycles of admission. A prospective student can walk in at the Regional Centre along with credentials and requisite programme fee and submit his admission form. The Union HRD ministry has sanctioned Rs 3 crore for the development of state-of-art library at the Guru Nanak Khalsa College for Women (GNKCW). Jaideep Singh, officer on special duty, Union minister Arjun Singh, in a communication to principal Manju Chawla has informed about the amount been sanctioned by the ministry. The principal has also been asked to submit a comprehensive project proposal for the library directly to the UGC. The College of Agriculture, Punjab Agricultural University, will hold its 47th annual alumni association meeting on April 3 and April4. Dr Milkha Singh Aulakh, dean (college), said vice-chancellor of Guru Nanak Dev University, Amritsar, Dr Jai Rup Singh, would be the chief guest. The annual elections for the posts of the office-bearers of the Doraha and Khanna units of the Punjab and Chandigarh College Teachers Union were conducted in their respective colleges here today. Khalsa Girls Senior Secondary School, Civil Lines, organised a prize distribution function to honour its meritorious students on the school premises today. PCTE (Punjab College of Technical Education) will organise its 4th international conference on “challenges and developments in IT (ICCDIT-2008)” on May 30 on the PCTE premises. Established in August 1999, the college has more than 1,400 students enrolled in various courses. Justice Uma Nath Singh, a judge of the Punjab and Haryana High Court, today inspected the working of local courts. He went to almost all the courts. The medical education unit of Dayanand Medical College and Hospital organised the first North Zone Elementary Statistics Workshop on the old DMC campus here today. Approximately 100 delegates from Punjab, Haryana, Delhi and Uttar Pradesh attended the workshop. 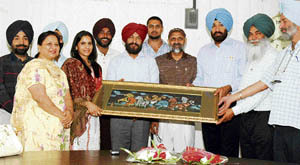 Basketball legend of yesteryear’s, Gursimran Lalli, who brought laurels for Punjab and for the country on numerous occasions, during 1980s, was honoured by the Punjab Basketball Association and the District Sports Department at a function organised at Guru Nanak Stadium here today. The three-day North Zone Inter Medical and Dental Colleges Tournament (NOZIT-2008) concluded with a glittering prize distribution ceremony held at Dumra Auditorium of the DMCH.